This is our slate pool table after refelting with speed cloth. Complete step-by-step instructions on how to refelt your pool table yourself is what this site is about. The most important part of playing a good game is playing on a good table. The main table surface should be made from slate. The different grades of tables are reflective of price. On the high end of the scale, the table will be made using 7/8″ – 1″ thick slate. The lower scaled tables will use 3/4″ slate. In either case, the slate will extend past the playing surface to the ends of the table, thus allowing extra support for the rails. But what else should be taken into consideration when thinking about what pool tables are made of? Better tables will have a wood backing for the surface cloth to be attached. Some lower-end tables don’t have the wood backing, and the cloth is attached with a spray adhesive, which can cause puckering or peeling especially if moisture and humidity are prevalent. In older tables, horizontal holes were drilled in the slate edges and filled with molten lead; screws running through the vertical edge of the rail were tightened into the lead-lined hole. In contrast, rails are attached to modern tables by inserting a bolt vertically through a hole in the slate and tightening it into the bottom of the rail, pulling the rail and slate together snugly. You have many choices when it comes to what pool tables are made of including slate thickness, cloth weight and color, material used for rails and pockets, and more. Your playing surface and felt should be the main concern for quality. There are more than 30 color choices (plus custom designs). Surfaces come in various weights, common choice is 20 to 22 ounces. Normally, a nylon-wool blend. 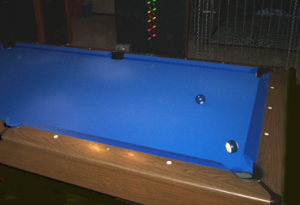 The cloth used to cover the slate and the rails is designed specifically for pool tables. Although it’s often referred to as felt (a fabric formed by compressing fibers rather than weaving), it is actually a woven fabric with a nap on one surface. Speed cloth (aka worsted cloth) is used primarily in professional environments, such as tournaments, pool rooms that host league and tournament play, and by individuals seeking a higher quality gaming experience because balls roll faster on speed cloth (hence the name) as compared to woolen cloth (aka felt). Rails and pockets are personal choices for color and materials. You can go plain or have carved rails with leather pockets. Diamond- or circular-shaped sights embedded in the rail tops are usually made of mother of pearl, abalone shell, or plastic. Pocket irons may be made of cast iron, zinc alloy, aluminum, rubber, or high-impact styrene plastic. Traditionally, pocket liners are made of leather (solid or net), but plastic or rubber is also used. A well made table will last years. However, inexpensive tables that might have particle board components instead of wood, won’t last nearly as long. Tables vary widely in quality and cost particularly when it comes to the details of what pool tables are made of. A casual player who wants a table for a few years of personal recreation can get one for around $600, less if it is used. Popularly priced well-built tables, that are durable and attractive can cost $1,600-$3,000 and up — and UP can be a lot as you refine your choices. Recently I saw a Brunswick Isabella 9-foot pool table listed for $39,999! You can see a wide range of pool table prices on Yahoo. If you’re in the market for a new or used table, I hope you feel more informed as to what pool tables are made of so you can make the right choice for your purpose. What tips would you offer someone looking to buy a pool table? What questions do you have about choices in pool tables? Join in the conversation! We’d love to hear your thoughts.